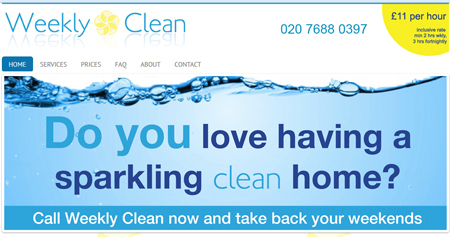 I began working with Katherine in January 2013 to build a website for her exciting new venture, a modern cleaning service aimed at busy professionals located in areas around north London. Katherine was very clear about the type of website she wanted and the message and feel she wanted it to convey to prospective customers. The brief was to create a fresh exciting website to serve as an online shop front for prospective customers. As a new venture the website was designed to be scalable to grow with the business and we chose to build the website in WordPress allowing Katherine to update information about the business as she needed to. The website includes an easy to use contact form allowing Katherine to receive contact requests from prospective clients and there is also a blog function built in that can be used as and when Katherine decides to make use of an updated news/blog section. WordPress training to be able to update and manage the website was provided. WordPress also allows for the website to be built from the bottom up in a very search engine friendly way and which makes future SEO on the website a lot easier. The website build was done across about 3 weeks which gave us lots of time to coordinate the best ways to showcase the relevant information on the website, tweak areas once the final draft was done and also work with the graphic elements. I wish Katherine all the best in her venture and am sure that with a strong business sense and clear view of where she wants to take the business it will not be long before Weekly Clean are the cleaning services of choice in the North London area. Visit the website at: www.weeklyclean.co.uk. Logo, graphic elements and marketing materials designed and created by Sarah Irving, Dollie Graphics, and on Facebook.